When the water-diviner feels the currents psychically, the Y-shaped twig starts moving. The persons who create motivating force through idiomotor response do not have any idea that they are the cause. It is these involuntary muscle movements, which cause the water divining stick to revolve and the planchet to work. Effect: Water divining by a Y-shaped branch of a tree. Props: Y-shaped branch of a tree. Method: With little unconscious pressure on the two branches of the Y shaped twig, which is held in two hands, it revolves by itself. 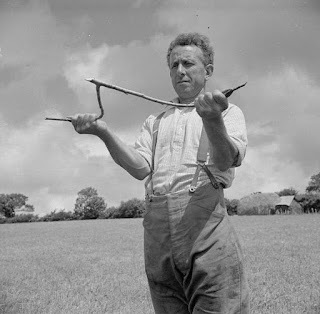 The diviner first knows about the underground water spring by looking at the big trees and ant hills and in the guise of psychic power gives a little pressure on the two branches of the Y stick which makes it turn in his hand.